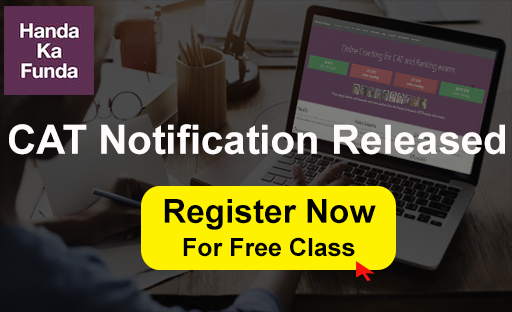 CAT 2018 Exam Notification will release tomorrow (29th July) on the official website. However, it is already out on news websites like LiveMint. The exam will be held on 25th November 2018 in two slots. This examination is one of the toughest examinations to take admissions in Management Schools of India. Candidates have to register and fill the CAT 2018 Application form online to enroll themselves for CAT 2018. However, you can fully complete your CAT 2018 Preparation with an offline coaching or the Best Online CAT Coaching from now on, keeping November as the month of the exam in mind. 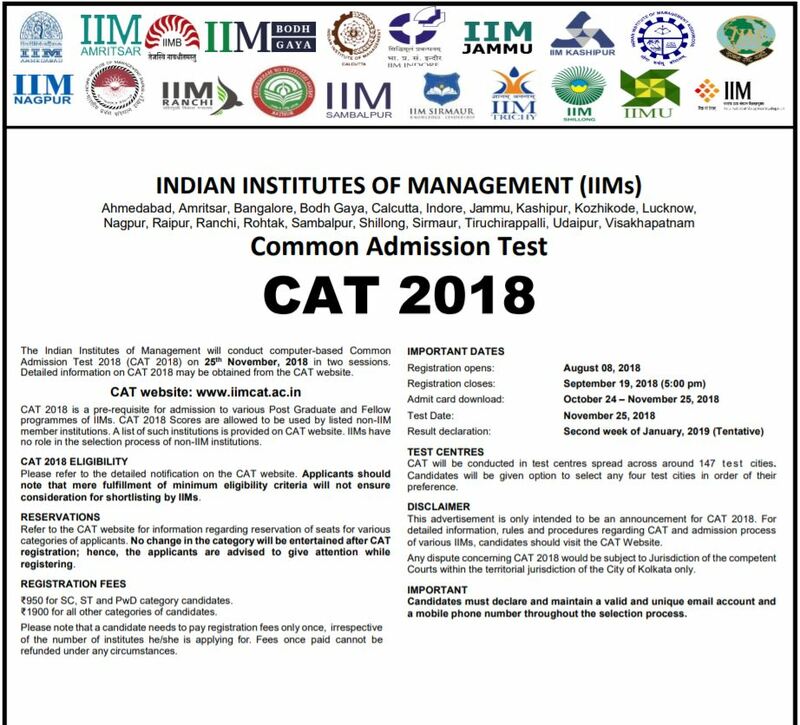 1) Registration for CAT 2018 will open on 8th August 2018 and will close on 19th September 2018. 2) CAT 2018 will be conducted in Test Centres spread across approximately 140 Test Cities. 3) Candidates will be given the option to select 4 Test Cities in order of preference. Test Cities and Centres will be assigned to the candidates only after the last date for CAT 2018 registration and hence candidates need not rush to block slots and cities in the initial days of registration. The authorities will try our best to assign candidates to their first preferred city. In case it is not possible, they will be assigned a city following their given order of preference. In the rare case that a candidate is not allotted any of the preferred cities, he/she will be allotted to an alternate city. However, candidates will not be able to select the session because it will be assigned randomly. 4) Candidates must pay the registration fee through online payment modes only, which include credit cards, debit cards, and net banking. 5) After submission of Application, candidates will be permitted to download their Admit Card from 24th October 2018 onwards, till the date of the test. 6) The duration of the CAT 2018 Exam will be 180 minutes. to be typed on the screen. The tutorials will clearly explain this. Also, we will allow a use of a basic on-screen calculator for computation. cannot switch from one section to another while answering questions in a section. 10) Tutorial to understand the format of the test will be available on the CAT website from 17th October 2018. Candidates are advised to work on the tutorials, available on the website, well in advance. 11) The website contains a section on Frequently asked Questions (FAQ), which addresses candidates’ queries regarding CAT 2018. 12) Candidates may also contact the CAT helpdesk over email or phone. The candidate must possess a Bachelor’s Degree with at least 50% marks or equivalent CGPA (45% for SC, ST and PWD/DA category) awarded by any University or educational institution as incorporated by an Act of the Parliament or State legislature in India or declared to be deemed as a University under Section 3 of the UGC Act, 1956, or possess an equivalent qualification recognized by the Ministry of HRD, Government of India. SC / ST / PWD candidates should have a minimum of 45%. For General and NC-OBC candidates, a minimum is 50%. The percentage of marks obtained by the candidate would be calculated based on the practice as followed by the respective University/Institution. In a case of grades / CGPA, the conversion to a percentage of marks would be based on the procedure as certified by the respective University/ Institution. If any University/institution confirms that there is no scheme for converting CGPA into equivalent marks, the equivalence would be established by dividing the candidate’s CGPA by the maximum possible CGPA and multiplying the result with 100. Read More…. Read More…. Read More…. Read the below-given information to enrich your knowledge about the procedure to register for CAT 2018 details including commencement of the application form, application fee, documental needs, etc. The most probable time for the opening of online CAT 2018 registration window is the second week of August 2018. The candidates need to upload the category certificate too while filling the CAT 2018 application form to avail the benefits. The candidates will have to select four (4) test cities according to their preferences and convenience. Candidates should get the printout of their completed CAT 2018 application form for the further reference. Candidates need to pay their registration fee along with the application form through online payment modes via Credit card/ Debit Card or Net Banking etc. How to do CAT 2018 Online Registration? Go through all the instructions mentioned carefully before filling up the form. For reporting purposes, Scaled Scores for each section (Section I: Verbal Ability and Reading Comprehension (VARC), Section II: Data Interpretation and Logical Reasoning (DILR), and Section III: Quantitative Ability (QA)) and Total along with the Percentiles shall be published. The process of Normalization is an established practice for comparing candidate scores across multiple Forms and is similar to those being adopted in other large educational selection tests conducted in India, such as Graduate Aptitude Test in Engineering (GATE). For normalization across sections, we shall use the percentile equivalence.